Getting ready for an adventure starts with the right look. You can't just jump into the jungle wearing a baseball cap. (Well, you can, but you just end up looking like a guy got onto the wrong bus). 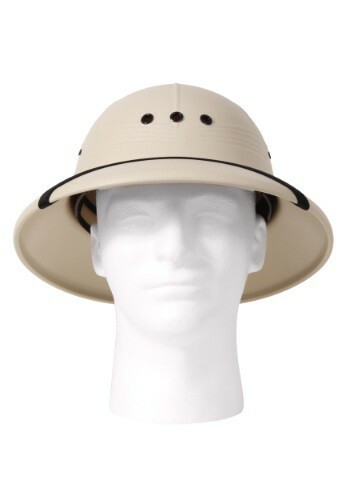 This Adult Deluxe Khaki Pith Hat makes you look like you're deep in the Amazon basin, ready to study animal wildlife. People might even start calling your Dr. Livingstone. Off in the African savannas there is an animal that just loves hold his head up high, the giraffe. This fun loving guy likes to walk around the grassland and just chowing down on the leaves of trees that no other animals can get. Why does he go for those leaves? Because the leaves way up high are the best tasting and Mr. Giraffe is the only one who can reach them. 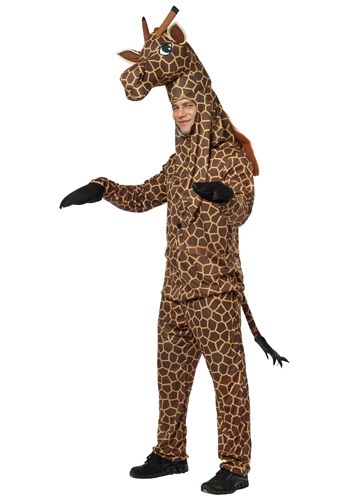 So if you want to look like the coolest animal you'd see on an African safari then this giraffe Halloween costume is for you. Your neighborhood might not be the wild plains of the Serengeti, but it's certainly a wild habitat of sorts. We'd like to know how you've survived there for so long without one of these pith helmets. You just never know when you'll need it to conduct a safari past all your neighbors houses. Aww, look at your cute little friend you brought along. How was life in the forest? Did you take a lot of pictures? I'm sure it often got lonely being so far away from home. Did the apes keep you company? I'd love to see your notes over dinner sometime. The cheetah is the fastest of all land animals--this big cat is able to run at speeds approaching 70 mph! 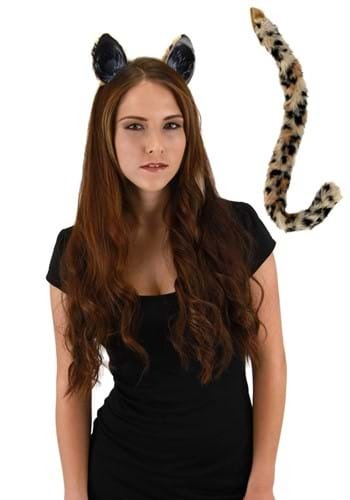 Become a sleek and elegant predator with this Cheetah Cat and Ears Tail Set. The tail has a loop that can be fastened to a belt loop, or a safety pin (not included) can be used to attach it to clothing. When Jimmy got into this giraffe costume, his career aspirations changed immediately. He had always set his sights on becoming a video game tester while moonlighting as an ice cream critic, but now he's going straight to the top as a world renowned expert on being a giraffe. This summer he's enrolling in Eating Leaves 101 and hopes to study Reticulated Anatomy during fall semester. That's right, little Jimmy's life changed the day he became a giraffe, inspiring us all to wonder just what kind of heights we might reach in our own sweet animal costumes. A group of rhinos is called a "crash," and your child can join the crash in this Child Rhino Costume. You better watch out because this young rhino is always ready to charge! Your little one will love wearing the cute and comfortable horn headpiece that completes the whole costume. He has just fed the baboons and now he's off to visit his favorite animals...the lions. If your little one is always asking to go to the zoo, this is the perfect costume for them. Have them explore wildlife all while looking the part. 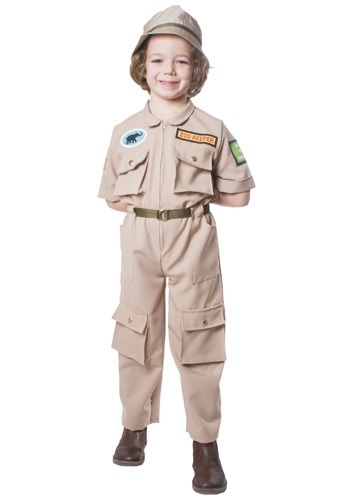 This costume is also great if your child likes to go on imaginary safari's in the backyard! Giraffe!!! The tallest beast out on the Savannah is now encapsulated in latex splendor. Now you have the opportunity to go as the long necked winner of the evolutionary sweepstakes. This mask has viewing holes through the nostrils and mouth, but just exercise caution if you see another giraffe. Your party might not be able to withstand the awesomeness of a giraffe fight! This is one of the best ungulate costumes we have on this site. I'm not gonna go as far as to say it's the best ungulate, but it's definitely the best in the Giraffa camelopardalis category... which, despite its esoteric name, is a totally competitive category. It's hard to tell whether he is a Nubian, reticulated, or a Rothschild giraffe, but either way, he sure is adorable! Now all your child needs is a blueberry lollipop to change their tongue blue... just like the real thing. The purpose of a zebra's stripes is to let it blend into the landscape of the grassy African savanna. 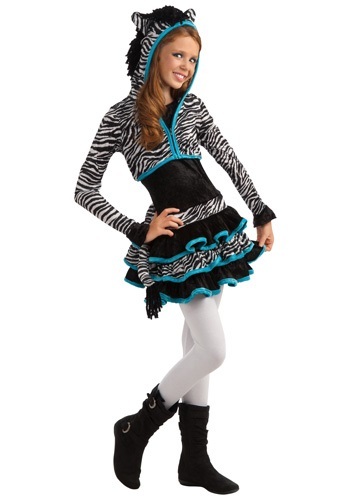 That strategy won't work if you wear this Girls Neon Pink Zebra Hoodie Costume! Add pink or lime green leggings or tights and black shoes to complete the look. Did you know that "hippopotamus" means "water horse" in Latin? And that hippos are actually related to horses? Complete this look with pink tights and shoes, and your little one can join Hyacinth Hippo in the afternoon Dance of the Hours. Check out that prissy zebra! This little zebra doesn't really like splashing in mud or going on long hunting trips; she'd rather stay in and paint her nails or do her hair. This Toddler Little Miss Zebra Costume is a great girly animal themed costume for toddlers. Pick up some black tights and ballet flats and you have the complete look.